Grammy Time Again And I Don't Mean Singing! 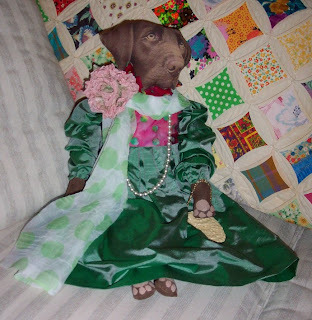 Lady Mavis comes from a long line of fine chocolate Labs from the county of Nottingham, in the United Kingdom. She was married for a brief time to Sir Jacques de la Fontaine, a scoundrel of a Lab from France. Unfortunately for Lady Mavis, when the ten pups came along, Sir Jacques ran off with a French poodle named Tootsie la Couer. For a time Lady Mavis was in a panic – how was she to raise all of those puppies on her own? She soon discovered that she had a talent for making delicious hand-molded truffles using the finest chocolate. Though she could not eat her own creations, (she somewhat wickedly used cats and squirrels and an occasional bird or two for taste testers), the chocolates became a hit in the local markets. Lady Mavis was set for life. Her pups eventually all made their own way in the world. Two still work with her, creating chocolates, one became a famous gourmet dog food chef, three became plumbers – they love water, another is a carpenter who helps beavers build their dams – he is really into chewing wood, one is a sculptor and one a potter, and unfortunately one is just like his father – he loves them and leaves them. Darling story and beautiful lab. 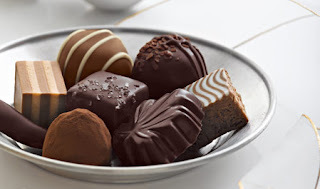 Love the chocolates too, they're making my mouth water.